Today, I bumped into Jeff from Rebel Cycles in Waterloo. 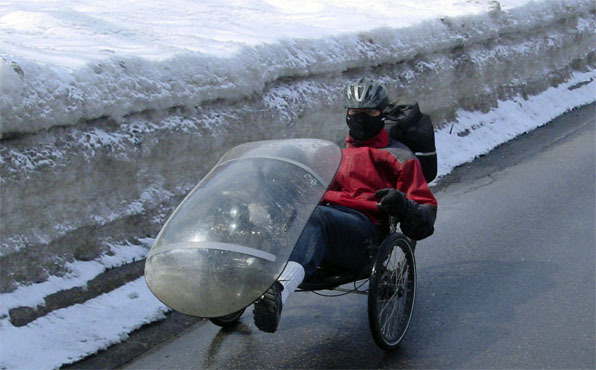 Jeff’s been riding his trike all winter long and told me that he probably never would have made it through this tough winter on a regular bike. I was surprised, as I’ve ridden through my share of winters and sort of prefer two wheels for the ability to use body English to get traction when I need it. Trikes do not typically have a lot of weight on the rear wheel so traction can be an issue. However, Jeff pointed to the studded tire on the back of his trike and it did look like it would do the trick. The other issue that sometimes scares people away from trikes is visibility, but Jeff had that problem licked with an animated LED panel mounted on his rear rack. The flashing LED’s were highly visible even in the light of day. I’m not sure how much more snow we’re going to be getting this spring, but judging by the size of the snowbanks in town, I think the long range forecast is for puddles. Here’s hoping that the Easter Bunny has fenders on his bicycle! You are currently browsing the Bicycle Forest Blog weblog archives for March, 2008.